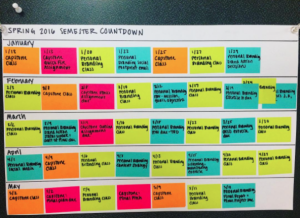 My best tip to any student, incoming or 5th year seniors, is to stay incredibly organized. Not only as a student, but as an employee as well, the most useful thing I’ve done for myself is master calendar making and managing. Every time something is asked of me or something is due, I immediately put it into my calendar. I have alerts the evening before and an hour before anything is due. Those are my “don’t forget” and “s*** you need to do this right now!” warnings. They both alert me that I’m behind on tasks, and though the blaring iPhone alarm is incredibly annoying, its definitely important because I’d always rather stay on top of assignment. In addition to my iPhone calendar I keep a color coded hard copy of my calendar in my room. I assign each class a color so that if I’m walking past and quickly see pink on todays date, I’ll be alerted that something is due in the class I’ve assigned pink to. This method has kept me onto of all that I need to be and has also prepared me well to be someone else’s employee. I am always on task and remembering due dates which impresses and satisfies my superiors.